We propose a novel hashing-based matching scheme, called Locally Optimized Hashing (LOH), based on a state-of-the-art quantization algorithm that can be used for efficient, large-scale search, recommendation, clustering, and deduplication. We show that matching with LOH only requires set intersections and summations to compute and so is easily implemented in generic distributed computing systems. We further show application of LOH to: a) large-scale search tasks where performance is on par with other state-of-the-art hashing approaches; b) large-scale recommendation where queries consisting of thousands of images can be used to generate accurate recommendations from collections of hundreds of millions of images; and c) efficient clustering with a graph-based algorithm that can be scaled to massive collections in a distributed environment or can be used for deduplication for small collections, like search results, performing better than traditional hashing approaches while only requiring a few milliseconds to run. In this paper we experiment on datasets of up to 100 million images, but in practice our system can scale to larger collections and can be used for other types of data that have a vector representation in a Euclidean space. Stakeholder Yahoo! Research , Futurewei Technologies Inc.
Yannis Kalantidis, Lyndon Kennedy, Huy Nguyen, Clayton Mellina, & Shamma, D.A. (2016). 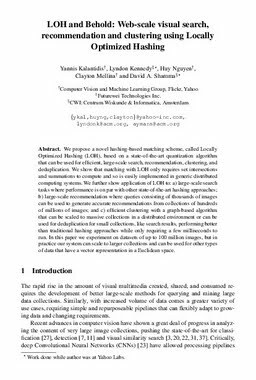 LOH and behold: web-scale visual search, recommendation and clustering using Locally Optimized Hashing. In Lecture Notes in Computer Science.